Smart marketers know that the first sale is the only beginning of a relationship with a customer. If your marketing stops after the first sale, you are leaving money on the table. Moreover, while there're lots of ways to extend that the lifetime value of a customer, there's one thing you should be doing first. Upgrade your order confirmation emails! And today we’re talking with Adii Pienaar of Receiptful. Adii is a serial entrepreneur "learning through making (new) mistakes." He previously co-founded WooThemes (exited 2013) and is currently working on Receiptful. He's also a husband, dad, complete wine snob, and occasionally suffers imposter syndrome. 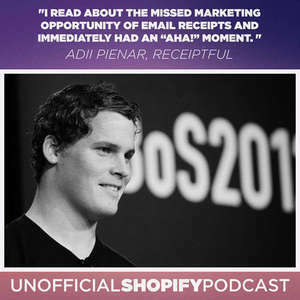 Subscribe to The Unofficial Shopify Podcast on iTunes! Subscribe to The Unofficial Shopify Podcast on Stitcher! Subscribe to The Unofficial Shopify Podcast via RSS!